Since Disney Springs began opening up the doors of its new establishments, it has become more and more difficult to keep up with the bounty of wonderful restaurants that continue to be welcomed to the area. One of the most popular destinations has become Chef Art Smith’s Homecomin’, and with good reason. From atmosphere to offerings, no detail has been overlooked. There seems to be a notion these days that great food is either coming from fine dining, even in its most modern incarnation, or from a best-kept-secret type of dive, and yet, Homecomin’ delivers on all fronts as being a family-friendly, middle of the road type of venue. The star of their menu, and everything else the restaurant offers, is the Fried Chicken Sandwich. On the menu it is listed as being buttermilk-brined for 24 hours and double-battered, dressed with hot sauce aioli, iceberg lettuce, tomato, and bread and butter pickles. It comes complete with a side of house-made barbecue chips drizzled with icebox dressing. The description alone has enough in it to make me giddy, from the bread and butter pickles, to the brining process, and even that icebox dressing drizzle, but the real question is can it deliver on the menu’s promise? The short answer is absolutely. I’m quite frankly not sure where to begin with this one because the entire serving makes me excited. Let’s start with the chicken itself; that seems logical. If you’re someone who likes lightly breaded and fried chicken, this isn’t the sandwich for you. The chicken is extra crispy with a breading that hits all the right notes for southern fried chicken, even without the bone. The buttermilk has definitely soaked into every recess of the chicken that it could, and the double-battering means that none of the juices escape. The hot sauce aioli is done right as well. While aioli is a fancy way to gussy up mayonnaise, here the hot sauce is the star and the mayo is only there to thicken it up a tad. It’s a heat with a tremendous amount of flavor provided by its peppers. Iceberg lettuce has taken it a bit on the chin lately, with everyone clamoring for something more green, with more flavor and nutrient value. I get that, I’m usually that person as well, but for an old-fashioned fried chicken sandwich, the iceberg lettuce is the right call. As for those bread and butter pickles, they are just like your family used to make, if they were known across the county for their pickling skills. I even asked for a few extra on the side, because, well, I love pickles and these are top notch. As for the side of barbecue chips and icebox dressing, these are also first rate. The chips have the barbecue flavor you are expecting, nothing fancy, but the chip cut is a bit thicker so there are no flimsy crumbling chips in the bunch. Icebox dressing may be a confusing name to some, it is basically a thin, ranch style dressing that has been prepared with herbs and spices at home and doesn’t typically have as long of a shelf life as typical store bought dressings. It had all the hallmarks of freshly made, with the herbs in particular having a stronger presence than could be tasted in an over the counter dressing. Honestly, my chips could have done with a double drizzle as the second layer of chips didn’t have as much, but perhaps it is best to leave us wanting more. It is getting more difficult as a writer in a crowded field to distinguish oneself, especially when it comes to food related content, which means we are often driven to hyperbole. I’ve always tried to give a blend of what is good and what isn’t in a particular dish or restaurant review, in order to give the words more credence. 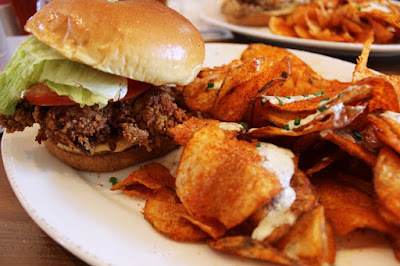 So, believe me when I say that the Fried Chicken Sandwich at Chef Art Smith’s Homecomin’ may be the best sandwich found at Walt Disney World right now, and if it falls a hair short on that mark, then it is most certainly the best chicken sandwich to be found. Period. Full stop.